Having had a number of camera lenses I have now settled on three. I bought these lenses progressively after much research, as I could afford them, and in line with what I felt I needed for the type of photography I wanted to do. I knew I loved them before I met them. The first of these is the brilliant Olympus M.Zuiko Digital ED 12-40mm f/2.8 PRO lens. If you were to just have one lens with this camera, this beautiful piece of engineering would be it. It is a wide angle to portrait length lens and also fantastic for landscape, people and street photography. A beautiful robust solid metal weather proof professional zoom lens with a constant f/2.8 aperture providing consistent low-light performance and shallow depth of field control. It's not cheap but diamonds never are. My next lens (below) is the Olympus M.Zuiko Digital ED 40-150mm f/2.8 PRO lens. Like the previous lens this is a premium waterproof all metal construction sharp telephoto lens. It's 150mm reach (equivalent to 300mm on a 35mm/full frame camera) has made it my go to lens for action shots, beach images involving people, cruise ship and wild weather photography. It spends more time attached to my camera than the other lenses as it allows me to quickly whip the camera out and capture those 'seize the moment' shots where good zoom capability is beneficial. It may sound confusing but after a glass of wine or two you'll soon move on to other things. 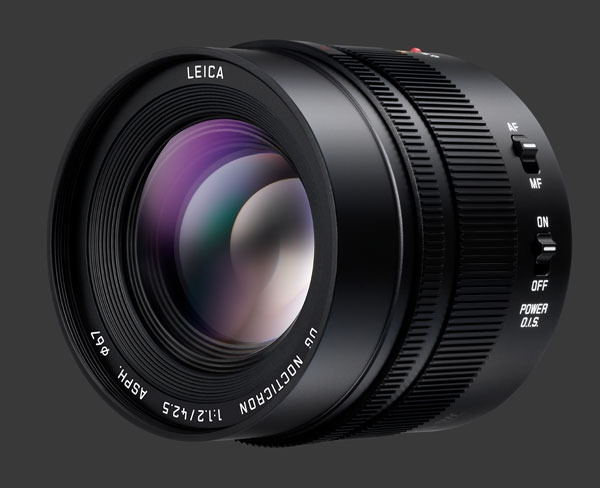 My third lens is the critically acclaimed Panasonic Leica 42.5mm f/1.2 DG Nocticron ASPH Power OIS lens. This is a beautifully built tack sharp and very fast portraiture and street photography lens. Use this in the street and you'll likely get wolf whistles. Given it is a fixed focal length lens there is no zoom function which means you have to move around with the camera to fill the viewfinder with the image you want. This isn't a bad thing. Provided you watch where you're going and don't trip over the family pet, moving around adds to creativity in composing the photo. Lenses like this are seriously attractive reasons to switch to the micro four thirds compact system camera range. There comes a point though where you have to evaluate just how much you want to spend on camera gear. Adding new/additional lenses is money that could be used instead on 'doing' rather than acquiring. It arguably would be money better spent on a holiday and taking photos of that holiday. It's 12 months since we departed on a wonderful trip to the UK & Ireland to see one of our daughter's and partner and to attend a family wedding in Ireland. It started pretty well as I'd booked a hotel room at Auckland Airport, only when we arrived it turned out I'd booked it for May instead of April and it was fully booked out. We were so lucky that after much fingernail biting on our part and good will on their part they managed to off load another booking. Unfortunately the original fantastic deal had to be replaced by a full cost room. Primarily based with our daughter and partner in Canterbury, Kent, we did extensive travel including towns and cities on the Kent & Sussex coasts from Whitstable, Deal and Margate to Dover, Hastings, Eastbourne and Brighton. We flew across to Ireland and Dublin, drove across to the Cliffs of Moher, Connemara, Galway, Westport and got a ferry out to the remote Aran Islands. From Ireland we flew to very beautiful Edinburgh in Scotland and rode on fast trains down to Durham and Manchester in the north of England and back down to London and Canterbury. Loved the experiences and hope to return to the UK again in 2017. 14 April 2015, Tauranga, NZ. One of the first photos I took after arriving in England. It was a very cold day in Canterbury, Kent, but undeniably beautiful with the new blossom and fresh colours of spring. It's so strange going from the falling leaves of autumn at home to new spring growth within about 27 hours. Canterbury, Kent, UK. April 2015. The photo below was taken by my father circa 1976 at least going by the age of the red Toyota Corolla in the image. It is taken at 'The New Brighton Ramp' in Christchurch, NZ. It is a beachside parking area adjacent to New Brighton Beach. As a teenager, apart from doing circuits around Cathedral Square in the heart of Christchurch City, in those days it was pretty much one of the only other popular 'cruising 'destinations. It was a place where we'd congregate. It was a place to display your car and/or your girlfriend or sit there in someone else's car with someone else's girlfriend. We'd sit and watch the cars doing circuits and gaze out at the chilly Pacific Ocean while eating fish and chips on our laps and Listening to Radio Avon, the first private radio station in Christchurch. The station went to air in August 1973.